Birders are utterly suspicious characters. By Greek law enforcement officers, I had already been taken for a spy. But, seen from the opposite angle, I do not look spylike, more like – a policeman! 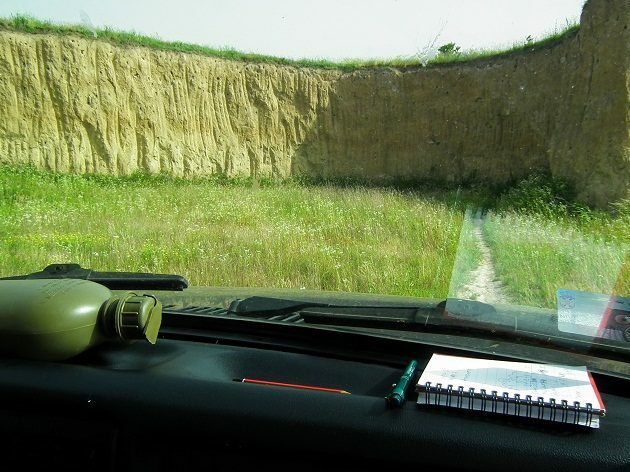 A month ago I visited this site, right at the edge of Belgrade for the first time, only to discover that I cannot get into the overgrown area in my low-clearance city car. Hence, I sat, parked in the last street – where the city ends, a coffee mug in my hand, binoculars around my neck, observing anything that flies. A black VW Touareg 4×4 with darkened windows approaches and I politely offer to move aside, to free the parking spot. A guy is curious what am I doing; watching birds; which birds; these, see that green-and-blue one (a European Bee-eater conveniently sitting on a wire); are you a cop; no, I’m not a cop (laughing at a guy who drives a way too expensive car for this neighbourhood); you’re suspicious, he concludes. Then he adds: No, you’re not a cop, they always come in pairs, they’re pussies, don’t you agree? Yes and no, I said, smiling all the time. He is puzzled: a policeman watching his house would not offer him a parking spot, yet, he does not know what to make out of me. Cops are all corrupted, he continues (that car vs. this neighbourhood – he probably knows what he is talking about), but I don’t think you’re a cop. Still, you’re suspicious. The other day, I came at 5.40 am with an ornithologist friend of mine by his Lada 4×4. The Touareg is parked, but no one is to be seen. 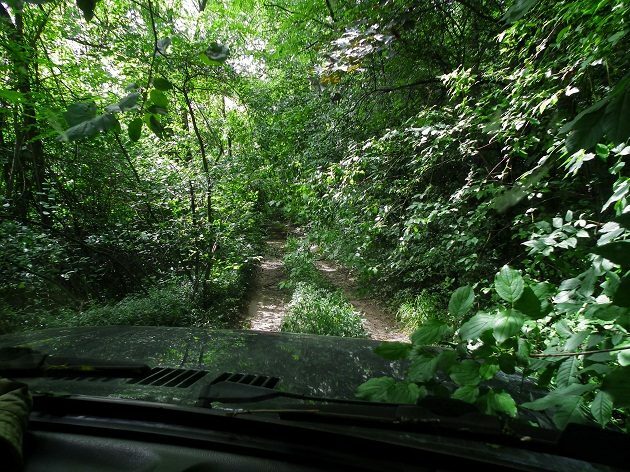 Over a few obstacles, we follow the dirt track into an abandoned and overgrown claypit. Although quite a few species will have a second brood (European Starlings among them), in the lowlands, mid-June is the end of the breeding season for many small passerines. 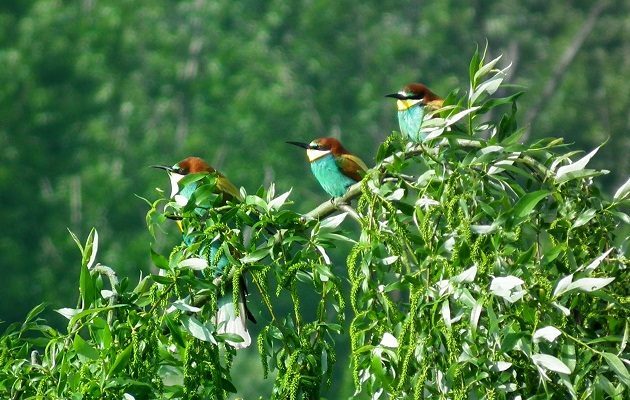 I am using one of the last days available for a proper census of the colony of European Bee-eaters. 500 m / 1650 ft long clay buttress in front of us, filled with many holes. Bee-eaters are diggers and they do not use an old nesting cavity, but dig a new one every year. Yet, Starlings cannot dig and are happy to use abandoned cavities. Tall grass is slowly turning wheat-yellow. One European Hare sits frozen, believing that he is invisible if he doesn’t move. We are sitting in the Lada, having coffee and observing clay cliffs. Bee-eaters spend a lot of time on the wing, balancing in the wind before they enter their holes. Starlings move in flocks, many brown fledglings from the first brood among them. Calling Eurasian Hoopoe, also a Little Owl… singing Ortolan Bunting… One Eurasian Magpie waits for a Bee-eater to land at the entrance of its nest, only to land on its back, hit it with its beak and pull the unfortunate Bee-eater down into tall grass that hides the gruesome part. Section by section, we count the new holes and the birds flying in or out, estimating the number of occupied nests and the percentage of Bee-eaters vs. Starlings per each section. Without slowing, a Common Swift quickly flies into one of the holes! They normally breed inside roof spaces of tall buildings and neither of us has observed them using clay cliffs. Five to six holes (possibly a few more) are occupied by Swifts – the fastest flyers in the bird world, making 110 km / 70 mi per hour actively flapping wings in horizontal flight. Checking the data later, I will find this type of nesting sites recorded in Serbia in the mid-20th century and probably becoming rarer afterwards, although it is currently observed at at least one more site in the country. Three hours later, the census is done. What to do next? We follow a dirt track uphill, criss-crossed with ravines, to reach the saddle between two hills, with a great view of the claypit and the river Danube in the background. One threatened European Turtle-Dove is in front of us, taking flight as we go further along the ridge towards the higher hill (it is in human nature, I guess – does anyone ever chooses to go for the lower hill?). While forest tracks are mostly used by hunters in 4x4s, as we go into the more open areas of peach orchards with Red-backed Shrikes, singing Common (Greater) Whitethroats and Yellowhammers, dirt tracks are now used by farmers driving tractors and cutting deep mud traps. We almost made it, but before the day was over, we needed one such tractor – merely 5 km / 3 mi from the edge of the city! A farmer who towed us refused to take any money for his assistance, saying that “thank you” is all he needs.